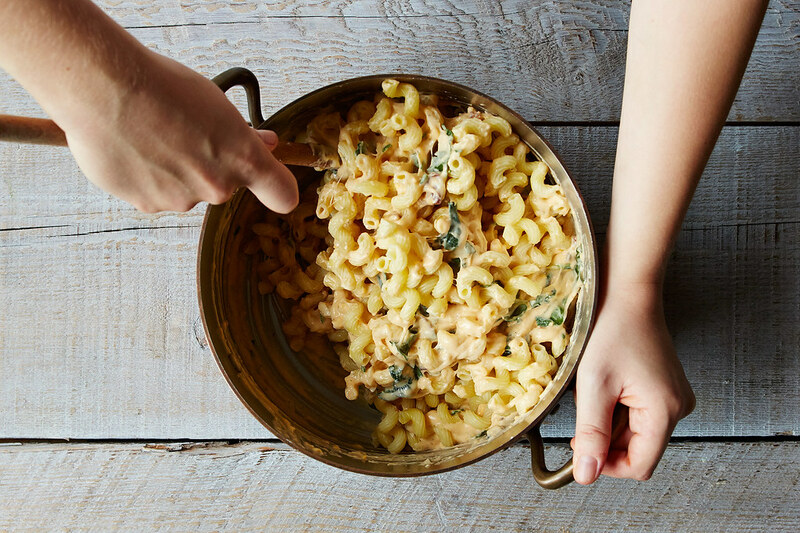 Today: Macaroni and cheese expert Catherine Lamb is showing you how to make this American classic — and a top contender for the ultimate comfort food — with whatever kitchen staples you've got. Ah, macaroni and cheese. How do we love thee? Let us count the ways: We love you from a box, preferably in SpongeBob or superhero shapes. We love Grandma's homemade version that she plunked down on the Thanksgiving table, right next to the green bean casserole. And don't tell me I'm the only one with a weak spot for the Velveeta version where you squeeze neon-orange goo out of a silver packet onto your shells, best consumed while watching The Magic Schoolbus. Haters may hate — that stuff was (and, by all accounts, still is) delicious. Let me back up: For as long as I can remember, macaroni and cheese was my birthday dinner. My mother made Martha Stewart's version, and I would always sneak some of the butter-drenched croutons before we all sat down to dig in. Over the years, I adapted it to whatever whims and ingredients I had on hand. Blue cheese and bacon? Sure. Greens and peas? That seems healthy. A topping of crumbled Cheetos? Yes, I did — and yes, it was just as good as you imagine. I became known for my mac and cheese. If there was milk and pasta and butter and cheese lying around (and when isn't there? ), you better believe I would mac and cheese-ify it. The ability to transform such refrigerator and pantry staples into a knock-your-socks-off dish of cheesy baked pasta is nothing to sniff at. In fact, it's a pretty valuable skill — and one I'm going to teach you today. 1. 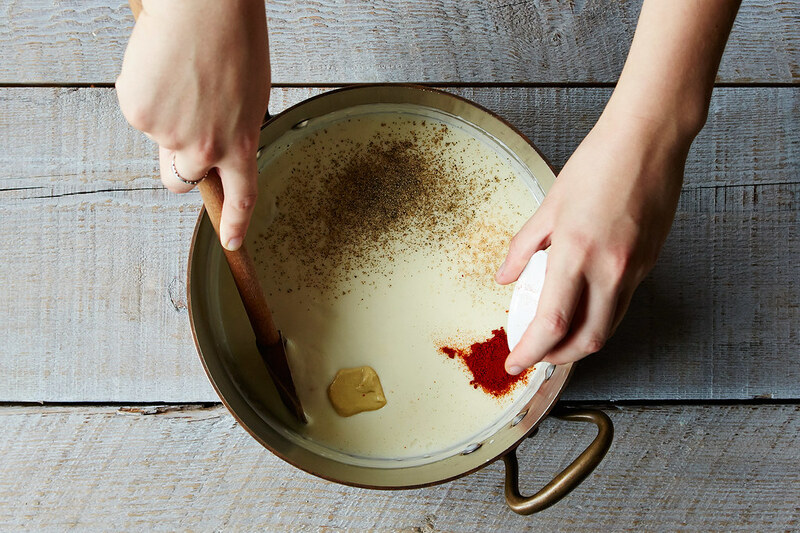 First, make a béchamel sauce. For a whole box of pasta, I recommend melting 1/2 cup of butter (1 stick), and whisking in an equal amount of flour to make a roux. Then start whisking in your dairy — I used whole milk, but you could also substitute some of it for heavy cream for a richer sauce. For however much butter you used, add in eight times as much milk or cream. So if you used 1/2 cup of butter, you'll need four cups of milk or cream. Whisk in your liquid gradually, then stand over the pot, stirring, until it's thick enough to coat the back of a spoon, about 8 to 10 minutes. 2. Next, it's time to add your grated cheese. I went with two parts Gruyère to one part sharp Cheddar, but you should march to the beat of your own drummer. Want something akin to the boxed dinners of your youth? Go with 100 percent Cheddar. Want something a bit funkier? Add some diced creamy blue cheese or smoked Gouda, or even a little crumbled goat cheese. I recommend steering clear of any non-melty cheese like feta or Parmesan — try sprinkling those over the top of your chef d'oeuvre instead for a crunchy, golden lid. In terms of quantity, only you can tell when to say when. I went with about three cups of cheese for a béchamel made with one stick of butter. 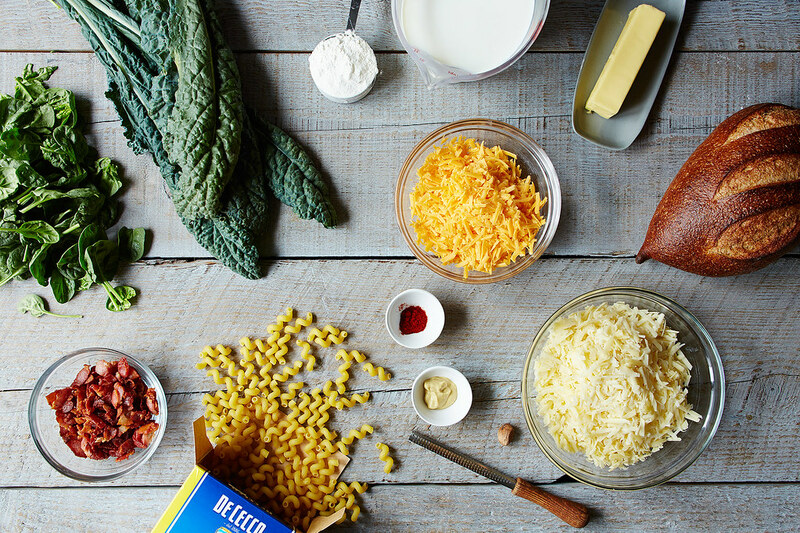 The more cheese you add, the denser and gooier your mac and cheese will be. If you add less cheese, the end result will be creamier and looser. Stir the cheese into the hot béchamel until the consistency is relatively smooth and most of the cheese is melted. Don't forget to reserve a half cup or so of your cheese to sprinkle over the top! 3. Now it's time for the add-ins. Think of this step like taking a trip to your favorite frozen yogurt shop or pick-n-mix candy store, only instead of mochi or gummi bears you can add in chopped, hearty greens, cooked meats, roasted vegetables, or shredded crab or lobster meat. I went with chopped spinach, kale, and bacon, because the greens add a level of heft and "health" to the macaroni, and everyone loves bacon. If you don't partake in meat, try adding some depth with sautéed mushrooms or caramelized onions. 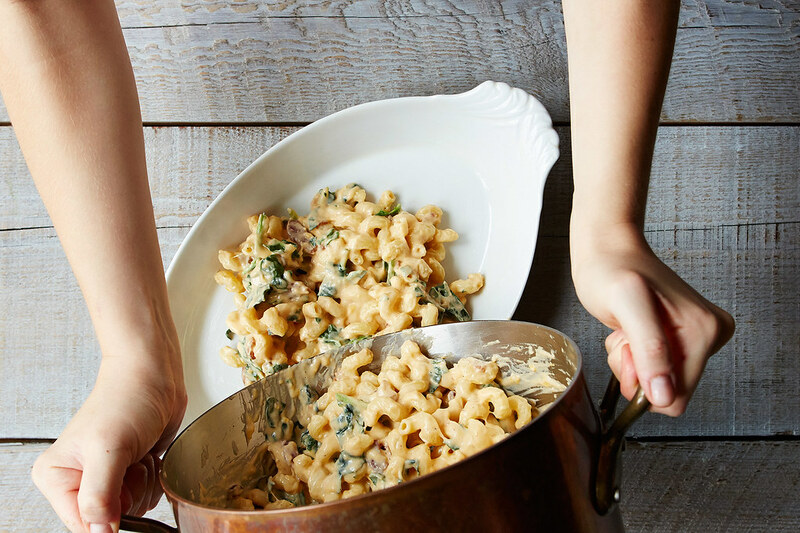 If you're a vegan, you should probably not be making macaroni and cheese. While all this is going on, cook your noodles in generously salted water for 2 minutes or so less than the box's recommendation for al dente. Your pasta will continue cooking in the cheesy, rich sauce and will absorb all the goodness in the oven. When it comes to selecting pasta, choose something with plenty of ridges and nooks and crannies, so it can hug all your sauce and mix-ins. I like cavatelli, since it's like macaroni — but more. Fold your cooked pasta into the béchamel mixture. I recommend starting with only 3/4 of the pasta you cooked; less pasta = more sauce = goopier macaroni and cheese. More pasta = less sauce = more block-like wedges of mac that you can cut out of the pan and sauté in butter. But that would be over the top, don't you think? 5. Pour the macaroni mixture into a buttered pan. If you live for crispy, caramelized noodles, you could even spread the whole thing out on a sheet pan. Sprinkle your reserved cheese over the top. 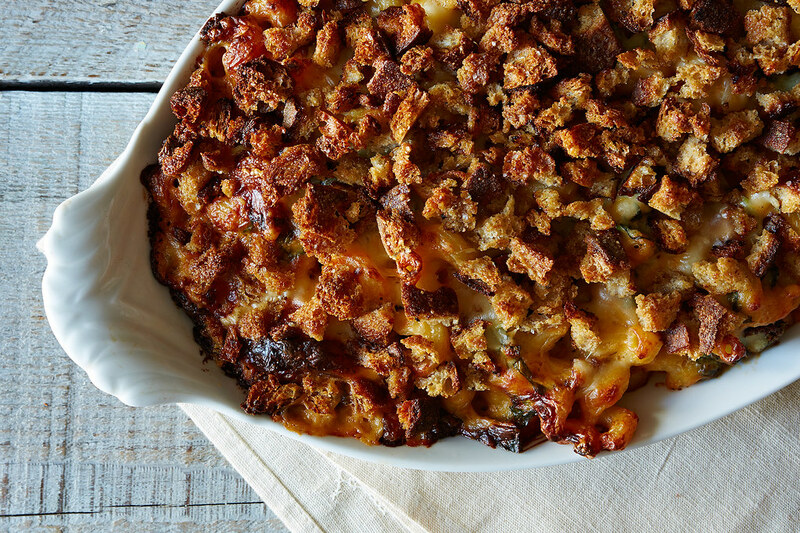 I like to cover my macaroni and cheese with some chopped, toasted bread for crunch — you could go with anything from large cubes of bread to blitzed, sandy crumbs. I recommend toasting the bread in a bit of butter or oil before sprinkling it atop your macaroni, because we're already going that direction. Bake your macaroni and cheese for about 30 minutes, or until the top is golden and bubbling with cheesy excitement. Invite over your closest friends, the ones you really, truly love. Or, do as I do, and attack the thing with a fork until sated, wrapping up the remainer in individual portions and freezing until the need for comfort hits.